For any celebration, it's great to open some bubbly, and there's a wide choice of sparkling wines you can select. For my birthday celebrations this year, I enjoyed three different sparkling wines. One of these was a Grower Champagne, the excellent Pierre Gimonnet & Fils Brut Blanc de Blancs Premier Cru, which I drank at Island Creek Oyster Bar in Burlington. I've visited that winery before and love their Champagnes, all which are made from 100% Chardonnay. It was a great way to begin my birthday dinner at ICOB. The other two sparkling wines were similar, both Crémant D'Alsace Rosé though from different producers. As I've said multiple times people, Americans need to drink more Crémant d'Alsace, and in fact, they need to drink more wines, of all types, from Alsace. They often provide excellent value and taste. They are enjoyable while young but can also age well. They can provide a sense of history, as well as showcase state of the art wine making. They pair well with a diverse variety of foods and cuisines. And at their most basic, they are absolutely delicious. 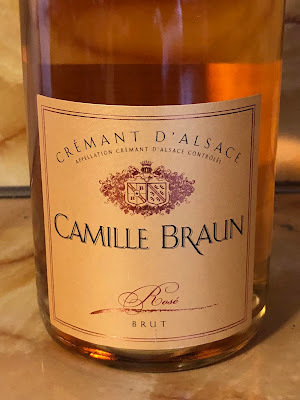 For more background on Crémant d'Alsace, check out some of my previous articles where I share my passion for this tasty bubbly, including: Crémant d'Alsace & The Spartans At Thermopylae, Schoenheitz Winery: A Taste Of Beauty, Puritan & Co.: Alsatian Wine Advice, Gustave Lorentz: More Alsatian Wine Treasures, Alsatian Wines & Pheasant at Craigie On Main, Crémant d'Alsace: A New Year's Eve Recommendation, and Starting the New Year With Crémant d'Alsace & Lobster. The history of the Domaine Camille Braun extends back to 1523 in Alsace, and they have been producing wine in the village of Orschwihr since 1902. Currently, the owners, Christophe and Chantal Braun, own about 13 hectares of vineyards in or near Orschwihr, including the famed Grand Cru site Pfingstberg, which has been documented since 1299. The vineyards are now certified organic and Biodynamic, and their total production is only about 8,000 cases annually. 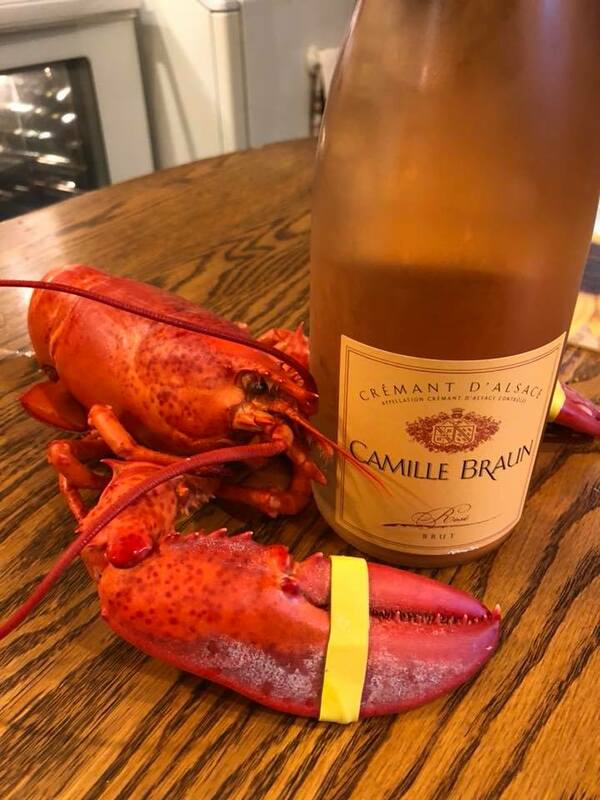 The NV Domaine Camille Braun Crémant D'Alsace Rosé ($25) is made from 100% Pinot Noir, the vines averaging about 30 years, as it is the only grape permitted in Alsace Rosé. Made in the méthode champenoise, the wine remains on the lees for about 18-24 months and only about 10,000 bottles are produced. The Rosé had a pleasing nose of red fruits and on the palate, the red fruits were more subtle and delicious, with hints of spice. It was dry and creamy, with a nice crispness to it as well. The fine bubbles helped to cleanse the palate and cut through the richness while I enjoyed this bubbly with a lobster dinner. An excellent choice for this pairing. Maison Willm's fame began before it ever started making wine, and it centered on a compelling recipe, Escargots à l’Alsacienne, in which the snails were cooked in a broth of spices and white wine. Around 1896, the Willm family established a wine estate in the town of Barr, located at the base of the Grand Cru Kirchberg ("hills of the church") de Barr. This is a prime area in Alsace for vineyards. In the 1930s, they were one of the first wineries in Alsace to export to the U.S., allegedly becoming a favorite of the gangster Al Capone! 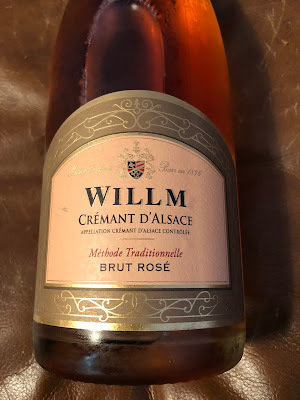 I've previously enjoyed a couple other of their crémants, including the NV Willm Crémant d’Alsace Blanc de Blancs Brut and the NV Willm Cremant d'Alsace Blanc de Noirs Brut. The NV Willm Crémant d’Alsace Rosé ($18), made from 100% Pinot Noir, is produced by the méthode champenoise and remains on the lees for about 12 months. With an appealing nose of red fruits and a touch of spice, this was a delicious and lush Crémant with ripe flavors of strawberry, cherry and raspberry. Dry, crisp, and clean, with a fine effervescence, this was a true crowd pleaser. At this price, it is an excellent value for the taste and complexity found within the bottle. Highly recommended!